Our wedding was a little over a year ago but I'm still working on designing our album, it's seriously time consuming. 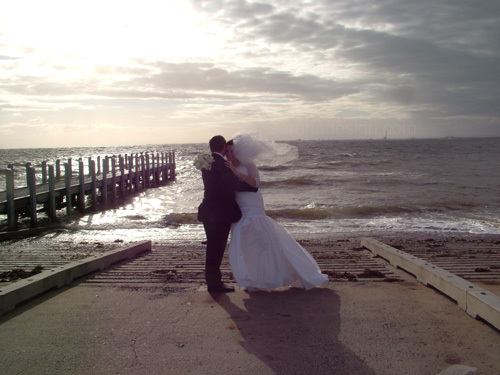 We had a great photographer (contact me for his details, in Melbourne, Australia) and we ended up with several thousand images. It was more economical for me to do my own album plus I wanted to continue our theme within it. But simply sorting through them to find the ones we liked best was a job in itself! Once settled in our apartment I got started on the album design and I'm still going. I'm making a photobook-type album rather than a traditional album, using our wedding logo and colors to embellish the design and make it unique. Anyway, I'm almost done (just the reception part to go) and I'm looking at options of who to use for printing. I want high quality print and binding for a reasonable (read: affordable) price. The sites I'm considering are: Photobook, Picaboo, Smilebooks or Shutterfly. I'm leaning towards a book with lay-flat pages (an option not offered by all companies) and often means standard hard cover without the option for a custom fabric or leather cover. The size is 12 in x 12 in, a less standard size so therefore less customizable options with some sites. If you have used any of these companies, I'd love to hear your opinion of the product your ordered. Or if there's another photo book printing company that is recommended please let me know.